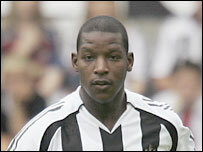 is this the most unlikeliest looking footballer in the world? I can imagine him selling vegetables on a wagon pulled by a donkey across dusty Spanish country lanes. See also: the entire spurs squad, ashley cole, robbie savage and jamie carragher. actually does look like a greasy bandit. he just looked like he'd come straight out of a Harry Enfield sketch. Used to play for Middlesbrough, looked like he should be laying carpets for a living.